The staff of the Historic Resources Management Branch wish you a safe and happy holiday season! RETROactive has had a great year and thanks goes to YOU, our amazing readers, for your support. We couldn’t have done it without you! We are also very grateful to our guest authors who shared interesting stories and research with us and our readers – thank you! RETROactive will be taking a break over the holidays — we will resume publishing on January 2, 2019. We look forward to seeing you all in the New Year! Seasons Greetings to all! 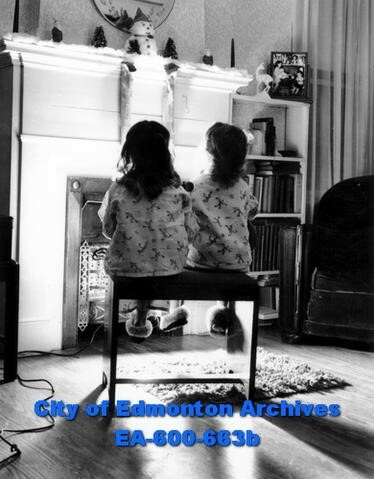 With the holidays approaching rapidly, many of us reminisce about the Christmas experiences from childhood. One of the common memories my co- workers and I share is waiting impatiently for the fabled Sears Wish Book to arrive in our mail boxes. For many of us, the arrival of Christmas catalogues was a much anticipated event in our households. The very name, Christmas catalogue, conjures up images of flipping excitedly through pages filled with shiny new toys destined for children’s wish lists. I for one, remember spending hours pouring over the catalogues, carefully folding the corners of the pages containing coveted items and circling of all the gifts I hoped Santa might bring me. In the late 19th Century, mail order catalogues for larger department stores in urban centres, such as Montreal and Toronto, were the norm for purchasing goods in rural communities in Canada. In 1822, the first mail order catalog in Canada was introduced by Carsley’s department store in Montreal. The first Eaton’s Christmas catalogue, called “The Wishing Book” was produced in 1884. Timothy Eaton’s vision was for the book to be accessible to all and “go wherever the maple leaf grows, throughout the vast Dominion.” The department stores had vast mail-order departments dedicated to making sure mail-order customers received their purchases no matter how far the goods had to travel. By the 1950’s, the ability to purchase a variety of consumer goods through mail-order catalogues expanded rapidly. Many department stores marketed to the young and old, with catalogues specifically designed for the lucrative holiday season. 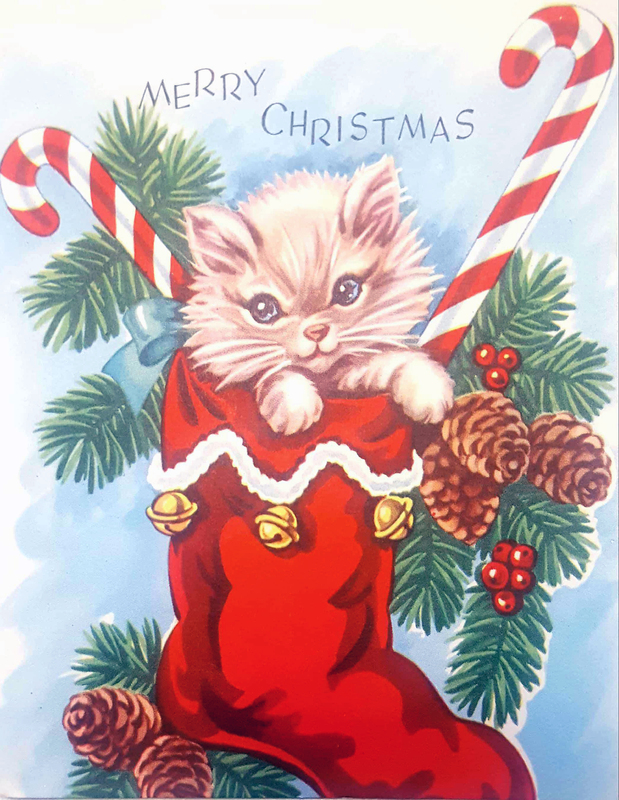 The catalogues offered a variety of gift-giving options from fashions to merchandise and included a special section containing all manner of toys for under the Christmas tree. In 1953, Canadian department store giant Simpson’s was acquired by the American Sears. The business merger resulted in the first Simpsons-Sears catalogue to be published and would eventually become the most successful department store catalogue in the country. If you would like to take a stroll down memory lane and revisit Christmas catalogues from your childhood, please visit Wishbookweb. This fabulous online resource of vintage Christmas catalogues has a current catalog page count of 25,617 pages. For Flash-enabled desktop browsers, users can enjoy full-featured navigation, including text-search features and special page-turning sound effects! Happy browsing!! Catalogue No.59 – Christmas, 1903 T. Eaton Co., accessed via: http://canadiandesignresource.ca/graphics/print/eatons-christmas-catalogue/, Dec 5/18. No. 72 Christmas Catalogue, 1905(Toronto), T. Eaton Co. fonds, reference code: F-229-231-0-5, Archives of Ontario. Christmas Book 1956 (Toronto), T. Eaton Co. fonds, reference code: F 229-231-0-17, Archives of Ontario. 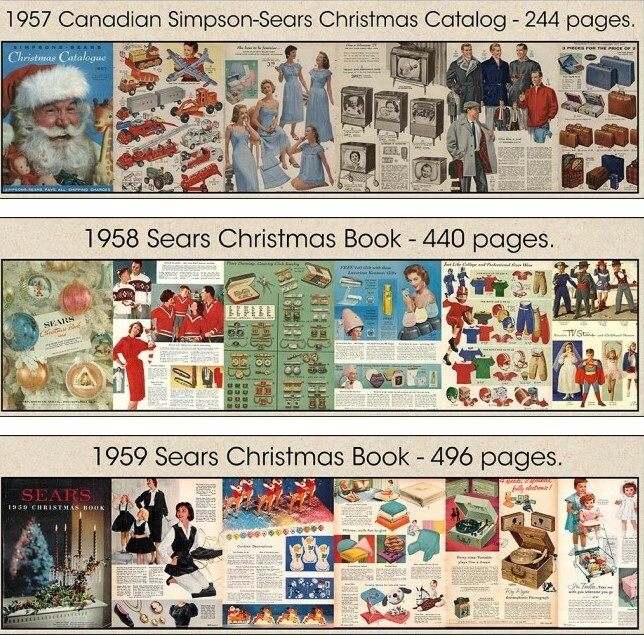 1957 Canadian Simpson-Sears Canada Christmas Catalogue, accessed via: http://www.wishbookweb.com/FB/1957_Simpson-Sears_Canada_Christmas_Catalog/#2, Dec 4/18. 1973 Canadian Simpson-Sears Wishbook, access via http://www.wishbookweb.com/FB/1979_Simpson-Sears_Canada_Christmas_Catalog/# , Dec 5/18. 1979 Canadian Simpson-Sears Wishbook, access via: http://www.wishbookweb.com/FB/1979_Simpson-Sears_Canada_Christmas_Catalog/#, Dec 4/18. Snapshot of a few Wishbook Web catalogue resources available, accessed via: Wishbook Web – The Christmas Catalog Archive Project, Dec 4/18. “A sincere wish for happiness at Christmas and throughout the New Year.” Christmas card, made in Canada date unknown. Written By: Marsha Mickalyk, Archaeological Permits and Digital Information Coordinator & Pauline Bodevin, Regulatory Approvals Coordinator, Historic Resources Management Branch. “The Story of the Mail-order Catalogue” http://www.virtualmuseum.ca/edu/ViewLoitCollection.do?method=preview&lang=EN&id=25258 retrieved Dec 06, 2018. 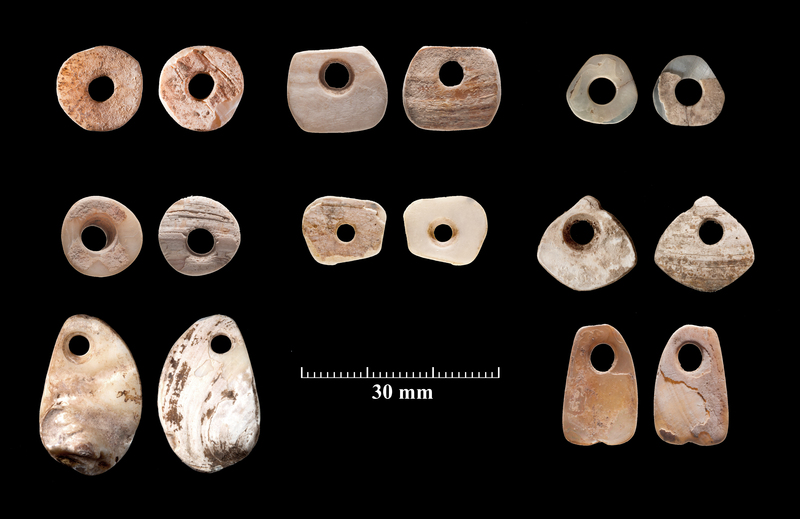 Thank you to guest authors, Margaret Patton and Shalcey Dowkes, for this interesting post about shell beads from a unique archaeological site in Southern Alberta. The authors would like to acknowledge the Siksika Nation and Blackfoot Crossing Historical Park in their support for the ongoing archaeological research at Cluny Fortified Village. Most beads from Cluny Fortified village are disc beads (upper left), but a variety of other shapes have also been found. For each pair of beads, the left image is the inside shell surface and the right image is the outside shell surface. All over the world beads have been manufactured for adornment in jewelry and clothing, trade, and may have even been used in storytelling and gaming. In North America, Indigenous groups in extensively traded marine shells. On the Plains, freshwater clams from local rivers were also used to manufacture beads. However, there are limited examples of freshwater shell beads found archaeologically on the Northern Plains. Over 1,450 pieces of shell have been recovered from the Cluny Fortified Village archaeological site, making it a prime candidate to study the production of beads on the Canadian Plains.